Tricker arc is not very common in lunar displays. That is not a big news, since it is often faint also in daytime displays. 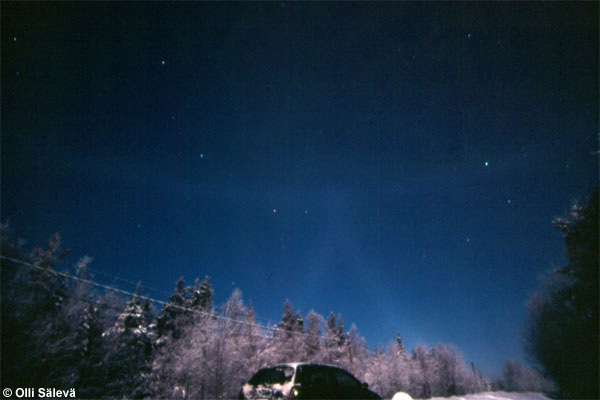 In Rovaniemi, a town at the Artic circle, Olli Sälevä observed this diamond dust halo display in 11 Feb 2006. Other rare halo in the display is a lower sunvex Parry arc which was found later in one slide. Lower sunvex Parry arc is even rarer than Tricker arc. Unfortunately it is only faintly visible below lower tangent arc near horizon. In the lower picture picture red arrows points the red inner edge of lower sunvex Parry arc. 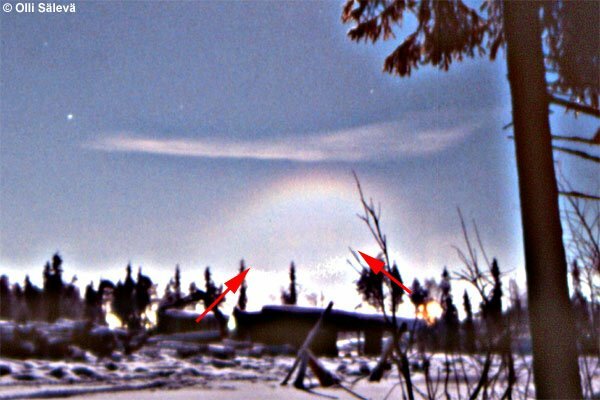 Picture is enhanced to show the faint arc better. 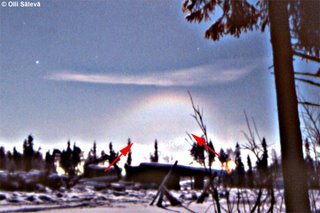 Other halos in this lunar display were a Parry arc and a faint infralateral arc and a parhelic circle. Also street lights has halos around them like Y-shaped upper tangent arcs and parhelic circle look-alike parhelia. Olli photographed the display with film camera. He was not sure, but he thought that there was something going on opposite to the moon. So he took a photographs toward anthelion region as well. It was a nice surprise to him to find a Tricker arc in photos. Since moon elevation was close to 30°, Tricker arc is visible here only downward from the parhelic circle. Photo shown here is enhanced to look more like the original slide. More photos taken by Olli Sälevä can be found here (rescanned versions will be upload later). Wow! Very impressive case. Excellent! Yes very impressive indeed. The pic that shows the lower tangent arc looks like it could contain lower sunvex parry arc. While I scanned those Olli's photos, I tried to see if there is lower sunvex Parry in that one slide, but I could not find it. There is some cloud or fog on horizon which may hide lower Parry from us. I rescanned Olli's photos with better resolution. Now the Tricker arc is like in the original slide. Because higher resolution, I was able to check that lower tangent arc photo better and there is a lower sunvex Parry arc! We will change those earlier scans of other photo also to new ones. Nice Parry! It is 7th lower sunvex on the World. Six cases is around Moon, only one case of lower sunvex is around Sun! Yep I looked at the pic showing lower tangent arc and as I say there was lower parry. I also got my copy of the new halo book and I can say is nice work. I don't doubt it's there - this is so typical display. But for me this one almost needs "eye of faith", as Mueller, Greenler and Mallman put it in their "Arcs of Lowitz"- paper.